According to all my preggo friends (and I have a lot...maybe they're trying to tell me something), you can figure out the size of your baby by comparing it to a fruit. One week it's the size of a kumquat, one week it's an orange, etc. Well for Liza, a good friend of mine from Charlotte Speech and Hearing Center, the "blueberry" week really struck a chord for her. She calls her little girl "Blueberry," so when it came time to throw her a little work shower, the them was obvious - Blueberry, duh. It was like the stars aligned for us, because despite it being the dead of winter, blueberries were on sale all over the place. It was theme party kismet, if you will. Decor-wise, I went with burlap, mason jars and blueberries. I arranged white roses and babys breath in mason jars wrapped with burlap and tied with a dark blue ribbon. For a blueberry accent, I skewered real blueberries on a stick and made them part of the arrangement. It was too cute if I do say so myself! I made mini blueberry Pie Pops which were fairly time consuming to make but were yummy and adorable. I vote that they're worth it! Recipe HERE. Blueberry Cupcakes (accessorized with a sweet onesie!) were made by my fav independent baking gal, Jen Panaro. If you're in the Charlotte area, contact her for all your sweet party needs! She is making a beautiful cake for an engagement party I have coming up in March. We did have some non-blueberry foods, like these cute "Birdsnests." These were homemade chicken salad in phyllo dough cups, and they were bite sized and delicious! This Asiago Potato appetizer is simply put, amazeballs. Recipe coming as soon as I can get my act together. Here's sweet Liza, all belly and still as pretty as ever! 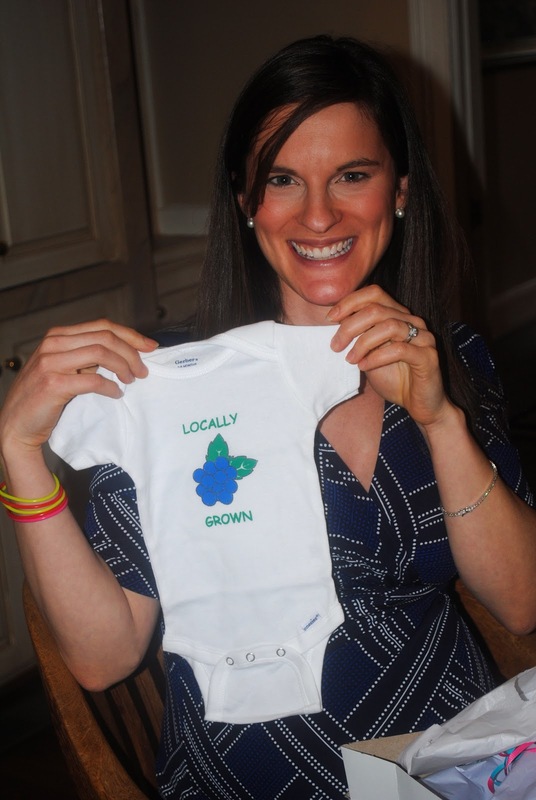 Check out this fabulous locally grown onesie :) Which if you know Liza and her affliction for locally grown healthy foods, it's the perfect outfit for her baby who will most definitely have a natural penchant for steamed broccoli and other veggies. For reals, Liza loves her veggies. 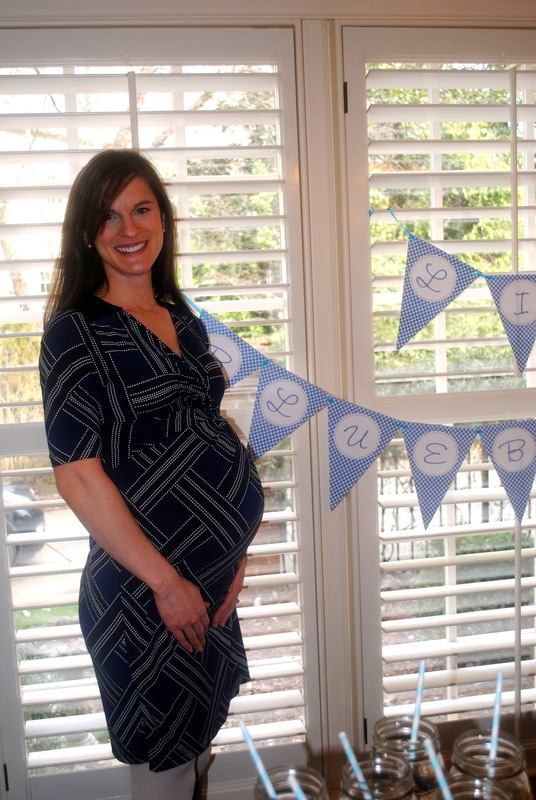 Liza is undoubtably going to be a wonderful mom, and I can't wait to meet her little blueberry! If you're hankering for something sweet and salty this week (to counteract all that veggie and blueberry talk above), check out my latest Tablespoon article featuring Rocky Road Pretzel Bites that literally take 20 minutes to make. BAM - chocolate in a flash! Have a great week! Such a cute theme! Great job incorporating blueberries everywhere…I especially like the blueberry skewers in the flower arrangements.